In the spirit of a Hardy Boys adventure, Puvungna (the book) is the novel written by Daniel Ross Stiel about two young brothers and their friends who travel back in time and discover an ancient Indian village along the shores of a Southern California beach, and the terrifying secret behind its disappearance over 400 years ago. You meet the spiritual leader of the native American people, Chinigchinich, and experience the Tongva people as they lived before their land was conquered, their spiritual history, and the events that changed a long-forgotten history which took place at Puvungna. Upon their return from the past, the boys must convince their parents and adults of their discovery, which ultimately changes their lives and their community. 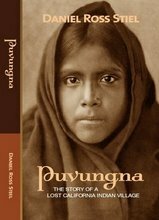 Puvungna is based on the true story of an ancient village and burial site believed to have once been populated by the indigenous Tongva people of California (who were renamed “Gabrielinos” by the Spanish conquistadors). The Tongva are the indigenous inhabitants who called Southern California their home for many thousands of years before the arrival of the Spaniards. The village of Puvungna is located on the campus of present day California State University, Long Beach along the banks of a now channelized creek, less than three miles from the Pacific Ocean. Believed to be the birthplace of Chinigchinich, a Tongva prophet, Puvunga is considered sacred by indigenous people. It is also believed by many modern-day Tongva people to be the place of creation. While little is known about the ancient Tongva people today, the names for many of their villages live on to modern day, including Cucamonga, Topanga, and several others. A wonderful story. It should be made into a movie.